Since 1984 Joel and Ethan Coen have been regularly subverting the tenets of Classical Hollywood Cinema in their astounding body of work. The writer/director duo has earned a fiery cult of worshipers that follow their films of bizarre snark and wit. In 2007 the Academy of Motion Picture Arts and Sciences finally recognized the Coen Brothers with the Best Picture Oscar for No Country for Old Men. Their take on Cormac McCarthy’s terse contemporary Western pays homage to an all but forgotten genre while still allowing the brothers to exercise unwavering authorship and style. Even while breaking away from many of the formal expectations of the genre (and Classical Hollywood Narrative), No Country for Old Men is a work that still manages to deliver as nothing short of a modern-day masterpiece. The first way in which the Coen Brothers transgress mainstream conventions lies in the choice of working within a genre that had all but been pronounced dead. No significant Western since Unforgiven (Eastwood, 1992) has enjoyed such mainstream success as No Country. The release (and subsequent success) of the film has ushered in what many refer to as a mini-revival of the Western with There Will Be Blood (Anderson 2007), a remake of 3:10 to Yuma (Mangold, 2007), The Proposition (Hillcoat, 2005), and most recently the Coen’s own remake of Portis’ True Grit (2010) faring well both critically and commerically. The genre’s iconography often includes vast barren landscapes, the heavy desert sun, cowboys, guns, and standoffs: many of which figure prominently in the Coen Brothers' film. From its inception, the Western has adhered to a strict ideology often centered on White expansion in the old western frontier of the United States as it dealt with themes surrounding civilization versus lawlessness. No Country for Old Men updates this slightly as the film is not set in the old west but rather 1980. 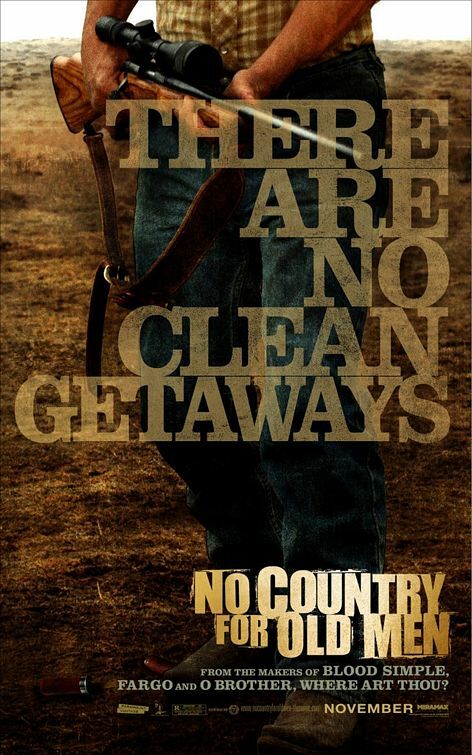 Also, instead of the civilized law fighting for their manifest destiny over the (racist) savagery of the Other, the anti-hero of No Country for Old Men is simply trying to stay alive in a cat-and-mouse game against villains sprouting from Mexican Drug Cartels. Another major way in which the Coen Brothers subvert formal expectations within No Country is by eschewing a prominent musical score. As Llewelyn Moss fights for survival against the ruthless Anton Chigurh, the battle is waged within a soundscape devoid of any non-diegetic music. Though the film’s score is credited to Carter Burwell nothing more than the occasional ambient tone highlights the action of the film. Typically, the Western is marked by an audacious driving score (think Ennio Morricone’s timeless Western motif from Leone’s The Good the Bad and the Ugly (1966) or the work of Dmitri Tiomkin in the cinema of John Ford). Yet even as No Country lacks a traditional score its potency to produce the intended emotions of anxiety are seemingly unimpeded. The Coen Brothers build their soundscape based purely around the diegetic elements at play: the charging gusts of wind out on the plains of Marfa, Texas, the steadily increasing rhythm of Chigurh’s tracking device, a distant ringing phone from a hotel concierge, approaching footsteps. By removing a standard musical track No Country is asking spectators to lean in and focus on the elements at play within the scene; to aggressively and actively read the text for information and not to rely on letting their emotions be guided by the film’s score. Additionally, within American Film history, the Western is often cited as a leading example of the Classical Hollywood Narrative tradition. This tradition, the dominant system for telling mainstream stories in narrative fiction film, is embodied by several rules including but not limited to: a goal oriented protagonist on a journey against forces of antagonism which culminate in a climax through which one destroys the other. However, No Country is not concerned with adhering to a typical three-act structure and reconciling the protagonist's journey. Rather, the Coen Brothers weave an engaging cat-and-mouse thriller whereby the anti-hero Llewelyn Moss (Josh Brolin) and the villain Anton Chigurh (Javier Bardem) never actually meet face-to-face and the one single conversation they do have is set at a remove over a telephone line. To add to this, Llewelyn is killed off-screen by another party and that shocking event occurs even before the second act draws to a conclusion. Such decisions often prove frustrating, even quite unsettling, for the viewer; much like the demise of Marion Crane at the midpoint of Psycho. Still, to discuss the film in relation to its adherence (or lack thereof) to the Classical structure within the Western is to miss the point of the film entirely. The reason for these significant deviations from Classical Design are not simply to allow the Coen Brothers to condescend to traditional filmic organization but rather to expand No Country from a straightforward exercise in genre (which until the death of Llewelyn Moss it handles expertly) into a greater work that reflects on the existential nature of evil within our contemporary world. To view No Country properly means one has to consider all three male characters at the center of the film: Anton, Llewelyn, and Sherrif Ed Tom Bell (Tommy Lee Jones) as characters that straddle a continuum of good-to-evil. Bell resides at one end, Anton the other and Llewelyn is the poor soul caught in between (hence anti-hero) who is not equally matched to survive in a world of such chaos. Llewelyn hunting the game is immediately contrasted with Anton hunting as he escapes from police captivity. Anton and Sheriff Bell both consider their reflections through Llewelyn's television set. Llewelyn and Anton both change bloody socks. Llewelyn and Anton both proposition strangers for their clothing. Llewelyn and Anton both pick shotgun fragments from their bodies. Llewelyn and Anton both crash their vehicles. All three characters travel into Mexico. Sheriff Bell and Llewelyn both utter the phrase "You Can't Stop What's Coming." Characters often engage in conversations with odd townsfolk (Anton with the landlady of Llewelyn's trailer park and with the cashier at a local gas station, Llewelyn with the propietor of a men's clothing store, etc. The unending parallels drawn between these characters are not merely coincidence but rather a design to link them thematically in their journey. Sheriff Ed Tom carries the third act of the film. He retires from law enforement after dealing with the situations at hand in the film not because he feels he's physically unable to carry out the duties of Sheriff any longer but because he cannot risk his soul for a world in which he no longer understands. The conversation-heavy final act ponders the mystery of evil in this world and it is argued that maybe this level of evil has been with us all along, it will never be escaped, and we must simply press through it. No Country for Old Men ends with an odd story in which Sheriff Ed Tom Bell recounts two dreams to his wife; both concerning his father. The dreams are spoken by Jones with the intact polysyndetonic syntax that marks much of McCarthy's work. The folksy wisdom meted out by Jones as he recounts his story is brilliantly simple: We look to our past and to our fathers for the light of guidance to shepherd us from evil. Sheriff Bell laments that God never came into his life and this fact leaves him in despair. Yet he dreams of his father's light guiding him through darkness. There is an unacknowledged spirituality that cuts across this seemingly simple genre film of cowboys, guns, and drug money. There is an exploration of much deeper philosophical concepts that do not contain easy answers. The Coen Brothers do not purport to have these answers. But they sidestep the trappings of Classical Hollywood Cinema and thereby force us to straighten up and pay attention.